Rittenhouse Square apartments offer more than just a place to live. The neighborhood is full of history, as well as cosmopolitan conveniences. If you want shopping, restaurants, and culture at your doorstep, consider renting or buying in Rittenhouse. One of the major attractions of a neighborhood is convenience, and Philly’s Rittenhouse Square has plenty. Rittenhouse Square apartments are steps away from grocery stores, clothing boutiques, hip restaurants, and a farmers market. The neighborhood is also accessible by a wide range of transportation options, from cabs to buses, subways, and trolleys. With all these perks, it’s clear to see why Rittenhouse Square is an attractive destination for city living. 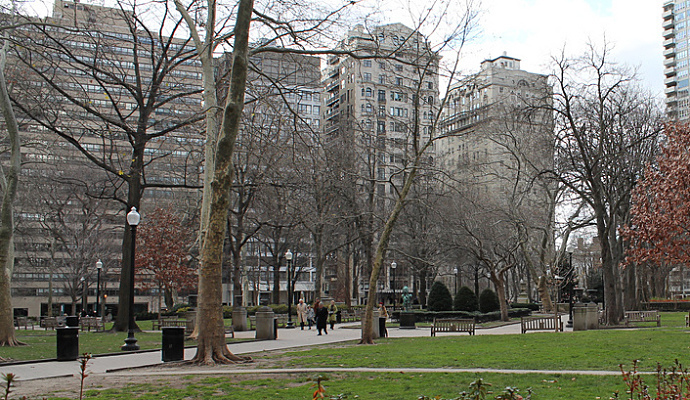 One major draw to the Rittenhouse Square neighborhood is its namesake park, one of the original parks in the city. The Square is a great place to go to catch up on a book, walk your dog, or pick up some locally grown produce. The Rittenhouse Farmers’ Market operates year round and is open on Saturday afternoons. In the warmer months, it’s also open on Tuesdays. Throughout the year, the park is the site of a number of craft and art shows, including the Fine Arts Show, which takes place in June and September each year. Even an average day in the park is full of excitement. Buskers usually set up in various corners of the Square, entertaining passersby with their cellos or accordions. The park’s scenery also makes it an ideal spot for painters to work on landscapes or other works of art en plein air. A number of apartment buildings tower above Rittenhouse Square. Some Rittenhouse Square apartments look out over the park, giving you a lovely view of trees and greenery. These high-rise buildings are also equipped with a number of amenities, which can include fitness and business centers, parking or valet options, and 24-hour doormen. If living in a tall building isn’t for you, the neighborhood also offers a number of rowhouses and brownstones with apartments. The Rittenhouse Square neighborhood is filled with restaurants, at a range of different price points. Located across from the Square, brasserie Parc offers you a chance to enjoy French food while you gaze out onto the park; Rouge and Devon Seafood Grill also boast fine park views. If you’d prefer to enjoy your food in the park itself, grab takeout from Shake Shack or Hip City Veg (which specializes in “fast-food inspired fresh vegan food”), located mere blocks away. The Rittenhouse Square area is a shopper’s dream. If you plan on living there, the neighborhood has you covered when it comes to the basics: Grocery stores include Rittenhouse Market and Food & Friends (which also sells beer), and a Trader Joe’s is a few blocks away. 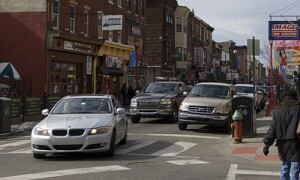 The stretch of Walnut Street to the east of the Square is lined with a mix of chain stores and boutiques. Clothing stores in the area include Anthropologie (which has its flagship store across from the park), Theory, and Gap, as well as small shops such as Knit Wit. If you want a good book, head into the Barnes & Noble just above the Square, or if you’d prefer to support a local independent business, visit Joseph Fox Bookshop. While you might find that you never want to leave Rittenhouse once you move in, the area is easy to get in and out of. 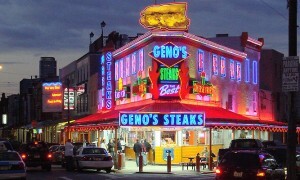 Hail a cab to travel to another part of the city, or hop on the SEPTA train at Suburban Station to head out of town.